The HEATING & COOLING INCENTIVE is available for residents and businesses (and businesses with residential-type systems) in Ontario who have purchased and installed* eligible central heating or cooling equipment through a participating contractor. You must be a resident of Ontario. All services (including purchase and installation) must be performed by a participating contractor of the HEATING & COOLING INCENTIVE program. 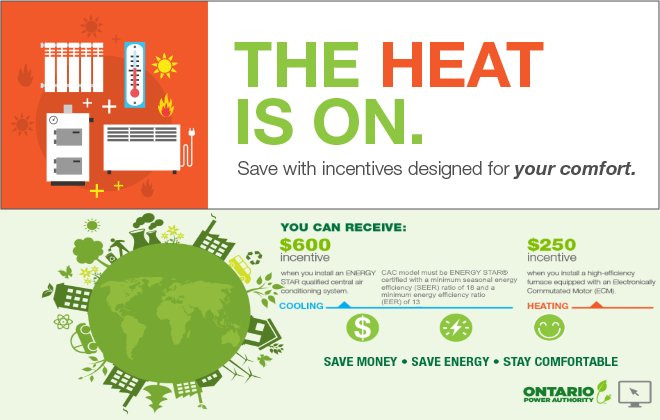 SaveONenergy program is offered by Mr. Heat Mechanical Inc. on behalf of IESO from Jan 01 to Dec 31/2018. Conditions Apply. Call us for more details. Click HERE for Terms & Conditions. Must be connected to a continuous 24 volt power supply source. Must be Wi-Fi enabled and controllable through a remote device. Must incorporate some form of occupancy based controls, such as occupancy sensors or geofencing, to detect home occupancy and setback during unoccupied times. Automatic scheduling of set points alone without occupancy detection is not sufficient. Must be compatible with any multi-stage heating and cooling units. Must come with a warranty of at least two years. Must be able to download any new software patches or upgrades released by the manufacturer. Note : Review the Heating and Cooling terms and conditions for more information on program eligibility. There has been some important changes to IESO heating & cooling incentive program in 2018.